May Madness Day 3: Exuberance! More fun with a 5 x 5″ Gessobord by Ampersand, and acrylic paints by Golden. This is what happiness looks like in my little corner of the world right now! Have I mentioned I love quinacridones…..in any medium? This one started out as another “window” painting, and went awry. I was getting discouraged, rubbed at a section with a wet paper towel, and quickly got right back down to the surface. Then I remembered they’re designed to do that! (You have to protect the surface with a fixative when finished.) So I decided to run the whole thing under the sink faucet! Didn’t take too long and most of the old painting was gone. There was just enough left to give me a bit of underlying structure for this new one. I started by getting the surface damp, then added some fluid acrylics and high flow paint (which are even thinner than the fluid acrylics, but still lusciously, densely pigmented). It was flowing well, and I liked the way it was developing, so I added more with the tip of my brush here and there to punch up the contrast and steer it a bit – but not too much, as I didn’t want any obvious brushstrokes to show. Purple and yellow are my favorite colors in the world, but I didn’t want them to get too friendly and make mud, so I had to be a bit careful. I sprayed the painting with a fine mister of plain water here and there and let the paint do its own thing. At times while drying, I propped it up very slightly to pool areas of the painting in one direction or the other. That’s pretty much it! Sometimes the work I enjoy best comes from a place where it’s very organic and the medium does most of the work. When it’s working like that, I just get out of the way as much as I can. An artist whose books and DVDs I can highly recommend is Chris Cozen. If you’re interested in painting with acrylics, I don’t think you can go wrong with anything she wrote or co-wrote. “Acrylic Color Explorations” and “Acrylic Solutions” are two of my current favorites. She is widely available in my local libraries, but I’ve purchased a couple of her books, and would definitely consider buying others. They are very hands-on, and will get you experimenting and enjoying yourself quickly. Her DVD lessons are all over Artist Network TV as well. She is so inspirational. I have seen them all, and pick up something new every time I re-watch. She has a background in education, and it shows. She is a wonderful communicator, and you’ll wanna run for your paint tubes every time you read her books or watch her lessons! I hope you have a wonderful spring (or autumn) Tuesday, and that the paint, pencils, pigments, pen, whatever you love most gets to come out and play. You deserve it. We are creators and we are on the move! Peace. Laura, this looks Gorgeous! shall I say that Again? GORGEOUS! great Duet of colors! the flowing design is lovely it takes you round and In… So cool! Debi, bless your bones! I was flying around the room yesterday after this happy accident took place! I am SO glad you like it too! I’m starting to feel like I’m on the right track!! Wooooot!!! Looks like happiness to me! I’m very familiar with running watercolor paintings under the faucet. That seems to happen to a lot of mine LOL. I wish I had your talent for turning them into beautiful works of art after they go through the faucet. Mine usually just turn into another mess. You’re showing me how to have fun, and that’s very inspiring. Thanks, I’m glad you’re inspired! This surface is basically treated Masonite, so it’s nice and hard and responded well to the rinse. In the past, when I’ve rinsed watercolor paper from sheer frustration and had another go, the best I could produce is an abstract work. But you’re probably supposed to wait for the paper to dry a bit and God forbid I would ever do something that required patience! This surface is very forgiving and for that I’m grateful! Art has been helping me develop patience, but it hasn’t extended to watercolor yet. LOL. I ruin almost everything I attempt because I don’t wait for the paper to dry. Amen! Oh I hear ya!! Acrylics dry so fast. If you don’t add an open medium to them. They’re not everyone’s bag but working with them helps a lot for me. I’m planning to start acrylics soon…but I’ve been sidetracked with figure drawing. I really enjoy it, but it is taking up a lot of my time. I dare anyone to look at your painting and NOT feel happy instantly! 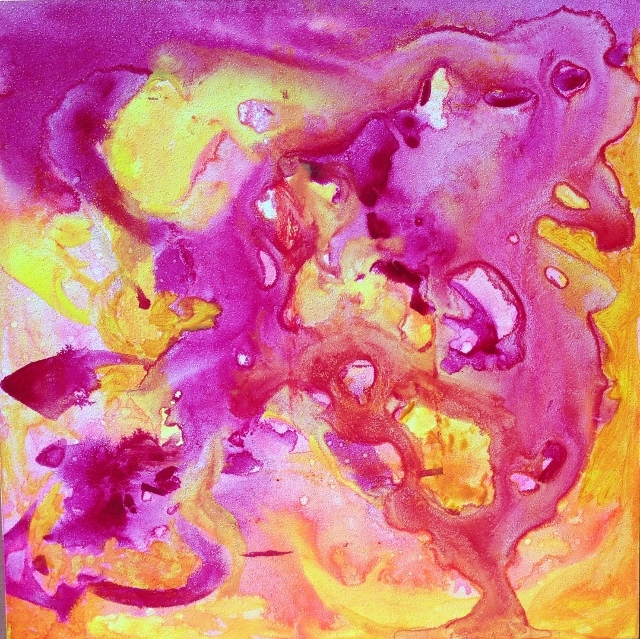 Exciting, bright colors, fluidity, and marbling – excellent! Thanks so much, Carol! That’s what I’m aiming for! And these colors just love each other so much. I’m really enjoying the transparent acrylic colors the most. I think that comes from working with watercolor for about a year before even trying acrylics. Still love the watery movement and the transparency and I’m glad I can still get that effect when I’m hungry for it. 💜 So glad you enjoyed it! Thanks, Jean, glad you enjoyed! OO this is so much fun! Love the title to this one, and the colors, and swirls brought a smile to my face. It’s a happy abstract! That’s the beauty of art, the art leads the way and we get to let go and enjoy the ride! I’m so happy for you and your joy, it’s contagious. I love the direction you are taking with your art. The colors and design are beautiful. Thanks for the information on Chris Cozen. I added her books to my Amazon wish list! Although I will also check out the library. I totally get why you loved doing this one, it is smiling at me in those beautiful colours, lush. Rebecca, thank you! I’m so glad you see a smile there! Because I’m floating after this one. What a cool giant experimental happy accident it was! Gotta love those! This leaps from the screen – what fun! Thanks so much, Michael! It was such a blast to stand back and watch!! Lol thanks Jodi!! Your swoon equals a Jill WOWZA in my head so I’m really thrilled you’re loving this one!! Aren’t the quins the best?! They’re my favorites in WC too! They move just the same in acrylic, when damp! 😍😃🎨🌻😎 I am just loving this abstract stuff. And ampersand boards, too, now I’m becoming more familiar with them! Thanks so much, Susan! I was so pleased with this happy accident! Thanks, Suz! It was a wonderfully happy accident! Yay, Jenny, so glad to hear this! Flinging joy to cyberspace 😀 ! Thanks so much, Vicki, and a big thank you for inspiring me with your amazing work! I’m so thrilled you like it; I was wondering what you’d think! Wooow! Absolute pink beauty! 💕😍Laura I found that you give justice to each color, so refreshing! You’re so sweet! Thanks, Teresa! Love this splash of color! Thanks, Teri! 😀 It was fun to make. Oh I like this Laura! Such bright and energetic colors! Thanks so much! It was a real pleasure to watch the pigments chase each other around! So glad you liked it! Beautiful! Love all that color! Thank you! It was a blast! Love those times when everything flows like it was meant to be (unlike tonight lol) 💜 Glad you liked it!! Wow! Love the flow and mixing of these wonderful colours. Sometimes it just works! An explosion of joy. Your painting makes me feel like summer is already here. Bright, bold and beautiful, as if the summer sun hits my the cosmos that will grow in my garden. Thank you so much, Connie. You understand exactly how I felt as this was coming together. What a wonderful comment; thank you again! The shapes flow so well into and out of each other that it creates a sense of movement and makes the painting look alive. Combine that with the vibrant palette and I get this sense of energy, like you’ve somehow managed to capture joy and put it under a microscope. This is really powerful Laura! Thank you so much, Jesse! Wow, I love the way you put that. So beautifully said and I’m so glad you see joy here because it was a joyful experience to create this! Did not take much water to get the paint to move on such a slick surface as the gessobord. Thank you for your comment. I hope you are sleeping now! It really is a fantastic piece! Keep up the good work. You should definitely do another. I will make it one of my Mother’s Day projects! Thx for the nudge. This one went over great, and I think it’d be cool when I open my Society6 shop – like for phone skins and bags and stuff like that. So glad you like! My daughter liked it too – and usually when the younger and older crowd likes something, I have a good feeling that maybe others might to. Wanting to launch an art shop(s) of some kind this year. Art won’t let me go (thank God). Thank you! Your confidence means a lot! You’re a kind man. And talented. You’ll go far, my friend. Have a great weekend. Enjoy settling in! Thanks, Donna! She has good taste hehe! Does she still like bold color?